This is a fun questionnaire! I also met my husband at work and he proposed to me on my mom's birthday by accident. I love this monthly questionnaire series. I love reading everyone's responses. I'm always amazed at how many people have met their spouses at work lol. I'm loving reading everyone's responses to this prompt but aren't all TBB prompts really fun?! We, too, don't do much for Valentines - we're of the opinion that it's hyped up alot more than necessary and why do we need to declare our love on V-day? Why not everyday, you know? I love the TBB prompts. I think Valentines is very hyped up. We always tell each other that we won't buy presents, but then we end up getting each other something small. Happy Anniversary! I love that you celebrate your anniversary all month long. Have a great day! Awww, how sweet that your hubs proposed on Valentine's Day! I didn't know that <3 we keep our celebrations pretty minimal, too. The first year we were together Bryan went all out and snuck into my apartment after work to cook up a delicious vegan feast. It was so sweet! 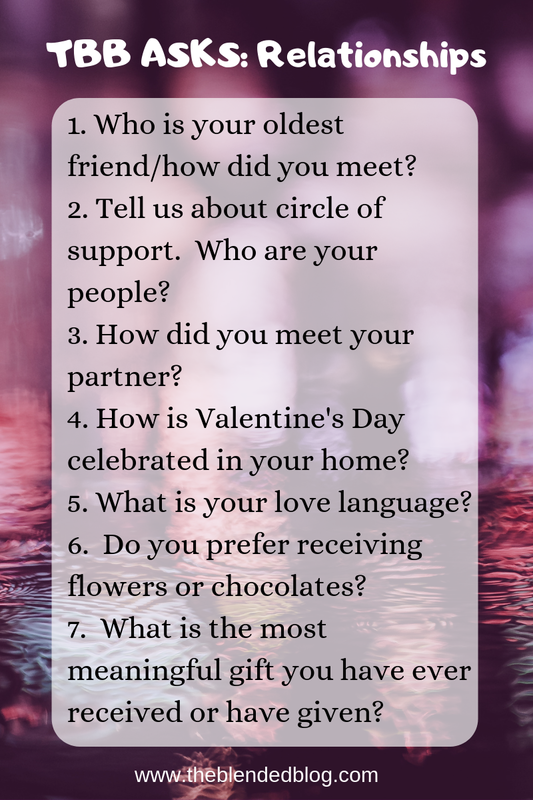 Now we typically order in or go out a few days after V-Day (I personally hate going out on that day, b/c waiters always try to rush you out), but it's fun to celebrate together, regardless of what you do :) PS: I have the same love language! That was so sweet of Bryan. I think going out to dinner a few days after V-Day is such a good idea. I agree waiters tend to rush people out and it's just way too crowded in restaurants on that day. I always feel bad for the employees. I think homemade gifts are great too! And holidays with little kids around are fun! Holidays with little kids are always so much more fun. I love making arts and crafts with my kids on holidays. That's really neat that you met your husband at work and that he proposed to you there! A work marriage- I love it! Thanks for linking up with us. I also love handmade gifts the best. That's so cool that your husband proposed to you at work...such a special memory! Thank you so much! It's was such a great day!